Often times, users will find that their materials testing system is no longer capable of meeting their testing requirements, whether it’s because it lacks capabilities due to age or simply because an expensive component has stopped working. Most users, unaware of the opportunity to retrofit their existing system at a much cheaper cost, will begin the search for a brand new testing system. Retrofits are performed on universal testing systems for a variety of reasons, ranging from the need for fully automatic closed-loop servo control or PC-based data acquisition to simply replacing existing dial gauges with digital indicators for ease of use and more accurate testing results. When retrofitting a universal testing machine, a number of different upgrades are available depending on the desired capabilities that the customer would like their retrofitted system to have. Explanations of the different retrofit services offered by ADMET are below. 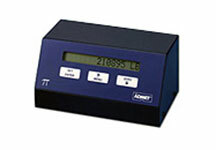 The most basic upgrade that ADMET has to offer replaces the existing dial gauge or digital indicator with a new single channel digital indicator like the Pi Peak Load Indicator pictured to the right in order to enhance testing capabilities and allow for effortless data analysis for peak load and stress testing. When using a universal testing system with dial gauges, data is recorded manually via a technician recording the value reported from the dial gauge. Not only is it incredibly time inefficient to manually record the data for each test procedure, but this method also produces a higher likeliness of error in comparison to data being recorded via a digital indicator. In an environment where newer standards and testing requirements are constantly being released, older digital indicators that came with the initial system purchase may not have the capabilities necessary to perform the required calculations. In these instances, retrofitting one of ADMET’s advanced digital indicators in place of an older indicator can enhance the system’s capabilities to obtain desired new calculations. A more sophisticated upgrade that ADMET offers involves replacing existing dial gauge or digital indicator with a multi-channel indicator, capable of measuring force, displacement, and strain. When customers desire to expand their testing capabilities in order to measure stress or strain, ADMET offers multi-channel indicators like the eP2 Digital Indicator pictured to the right. These indicators are capable of generating a stress-strain curve and calculating offset yield, Young’s modulus, ultimate tensile strength, and percent elongation according to ASTM E8 Standard Test Method for Tension Testing of Metallic Materials. New and existing extensometers and LVDT devices can be used with ADMET’s indicators in order to measure displacement and, ultimately, calculate strain. 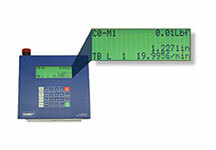 An upgrade to MTESTQuattro, ADMET’s most advanced controller, involves installing a PC-based application program and external interface box, which provides all of the capabilities of the multi-channel indicator, along with many more calculations such as plastic strain ratio (ASTM E517), and K and n values (ASTM E646). This system is capable of performing data analysis on a multitude of tests including tension, compression, creep, fatigue, friction, flexural, relaxation, peel, and shear tests. The base configuration of this retrofit upgrade consists of load, crosshead position, axial strain, transverse strain, and auxiliary input channels. In order to upgrade an existing static or fatigue based electromechanical testing system, new servomotors, drives, and amplifiers can be installed in order to further improve capabilities of the system to meet the customer’s requirements. Depending on the customer’s system parameters, ADMET can also potentially tie into existing drives and motors. ADMET’s most affordable hydraulic servo retrofit option involves keeping the existing hydraulic unit active, bypassing the existing manual control valves, and incorporating a servo-manifold into the existing hydraulic unit. This enables users to have full control of their system through a multi-channel digital controller or PC-based materials testing system MTESTQuattro. ADMET’s complete servo retrofit involves replacing the existing hydraulic unit with a new servo hydraulic power unit, which is commonly chosen when the user is experiencing issues with their existing hydraulic console. The user would then use either one of ADMET’s multi-channel digital controllers or the MTESTQuattro PC-based materials testing system in order to control the machine and collect data. By retrofitting an existing system, significant cost savings can be found in comparison to the purchase on a new universal testing system. The primary reason that retrofitting an existing system is so cost effective is because the most expensive and durable component of a system is its load frame. By retrofitting an existing system with a new indicator or controller, one can keep their existing load frame, ultimately expanding their system’s capabilities for minimal investment. By retrofitting an existing system, our customers are able to continue using their existing system accessories, whereas purchasing an entirely new system typically requires purchasing additional grips, load cells, and other accessories. A retrofit upgrade will result in increased functionality of the user’s system, additional flexibility in the variety of test results and analyses the user can perform, and improved accuracy of the materials testing system as a whole. Overall testing times will decrease significantly as the user will be able to store test procedures and obtain desired analyses without having to perform any calculations by hand. This streamlined data capture also allows for easy creation of comprehensive test reports. Having been designed decades ago, many universal testing systems lack the testing features and data acquisition parameters necessary to meet current and future standards. As testing organizations such as ASTM, ASME, ASSHTO, ISO, and others continue to revise and update their existing standards, ADMET is continuously working to improve capabilities of its indicators and controllers to ensure that users can perform these standardized tests without any complications or errors. ADMET’s GaugeBuster 2 and DFG indicators are frequently used to retrofit concrete testing systems and come with preset ASTM standards such as ASTM C39, C78, C109, C293, and C469. ADMET’s MTESTQuattro and eP2 controllers come preset with a multitude of ASTM, AASHTO, and ISO standards, and have the capability to add additional testing standards. Multiple analyses can be selected by the user in order to create custom test procedures as desired. If interested in learning more about the retrofitting process, please click here or comment below.